Includes is the Premium Well Padded Camera CASE / BAG and Full Size 60″ inch TRIPOD Accessories KIT, the Ideal Traveling Accessories CANON POWERSHOT G9X G9 X, G5X G5 X, G7X G7 X, G3X G3 X, G1X G1 X, G1 X Mark II, G1 X, G16, G15, SX710, SX700, SX610, SX600, SX410 D30, D20, SX700 HS, SX520 HS, SX510 HS, SX40 HS, SX280 HS, SX270 HS, SX260 HS, SX500 IS, S200, S120, N, N100, SX240 HS, SX260 HS, A2400 IS, A3400 IS, A4000 IS, S110, SX170 IS, SX160 IS, SX500 IS, A810, A1300, A2300 Digital Cameras. 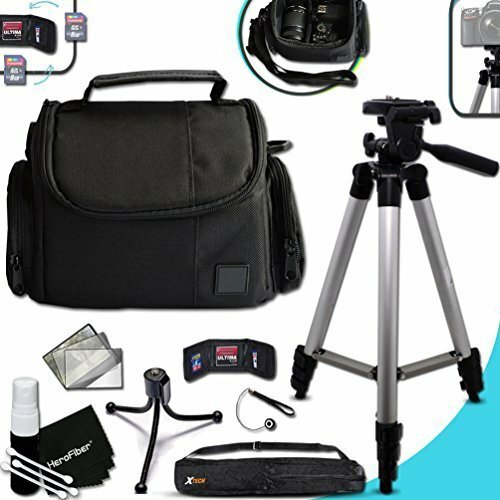 The KIT includes a Well Padded Camera CASE /BAG with Zippered Pockets and customized interior, designed to fit a Camera with Lenses and other commonly used accessories. Case Dimensions: 12 ½” Width x 6 ½” Depth x 7 ¼” Height. Additionally included in the Kit is a Full Size DURABLE 60″ inch TRIPOD with 3-Way Pan-Head, Bubble level indicator, 3 Section aluminum alloy lock in legs that folds back into 22.5″ inches. The Tripod is lightweight and includes a Backpack style Carrying Bag Making it an Ideal Camera Accessory to travel with. In addition the Kit includes a Memory Card Wallet Case Holder that holds Memory Cards separately, a convenient way to be able to identify each Memory Card individually + 2 Screen Protectors + Mini Table Tripod + a Lens Cap Keeper a convenient item that prevents losing a Lens Cap + a Deluxe Cleaning Kit and a HeroFiber® Ultra gentle cleaning cloth designed for cleaning electronics and accessories. Premium Well Padded Camera CASE / BAG and Full Size 60″ inch TRIPOD Accessories KIT includes the Ideal Traveling Accessories CANON POWERSHOT G9X G9 X, G5X G5 X, G7X G7 X, G3X G3 X, G1X G1 X, G1 X Mark II, G1 X, G16, G15, SX710, SX700, SX610, SX600, SX410 D30, D20, SX700 HS, SX520 HS, SX510 HS, SX40 HS, SX280 HS, SX270 HS, SX260 HS, SX500 IS, S200, S120, N, N100, SX240 HS, SX260 HS, A2400 IS, A3400 IS, A4000 IS, S110, SX170 IS, SX160 IS, SX500 IS, A810, A1300, A2300 Digital Cameras. Includes a Well Padded Camera CASE /BAG with Zippered Pockets and customized interior, designed to fit a Camera with Lenses and other commonly used accessories. Case Dimensions: 12 ½” Width x 6 ½” Depth x 7 ¼” Height. Includes a Full Size DURABLE 60″ inch TRIPOD with 3-Way Pan-Head, Bubble level indicator, 3 Section aluminum alloy lock in legs that folds back into 22.5″ inches. The Tripod is lightweight and includes a Backpack style Carrying Bag Making it an Ideal Camera Accessory to travel with. Includes a Memory Card Wallet Case Holder that holds Memory Cards separately, a convenient way to be able to identify each Memory Card individually + 2 Screen Protectors + Mini Table Tripod + a Lens Cap Keeper a convenient item that prevents losing a Lens Cap. Includes a Deluxe Cleaning Kit and a HeroFiber® Ultra gentle cleaning cloth designed for cleaning electronics and accessories.